One of my earliest memories as a kid was reading my Nan's war time poetry. The book was ragged and words faded, but it was in this moment I knew I wanted to be a writer. For me it's the best job in the world, but I'm aware it won't be for others - after all, job satisfaction is ultimately fuelled by passion. So, in said writerly fashion, I shall now arrange words in a particular order so that we can tangibly understand exactly what are the best and worst jobs in the UK? As you're reading this, somewhere in the UK there will be a child pretending to be an astronaut. Racing toy cars. Doodling. Building Lego houses. Styling a doll's hair. Now while these activities will be familiar to a lot of children, they will resonate more with some than others. There'll always be one child that doesn't stop drawing until their pencil runs out, won't stop building until all Lego bricks are used, and plays football until the sun goes down. These are the ones that will likely grow up to be artists, creators, craftspeople, athletes. Balanced working hours, job security and positive workplace relationships all contribute to employee loyalty and job satisfaction. There is a level of persistence and devotion we all give to a specific activity that, when paired with raw talent, can be a very powerful combination that leads to a successful career. (Although I would like to stress that raw talent isn't always necessary, so long as hard work and practice exists). 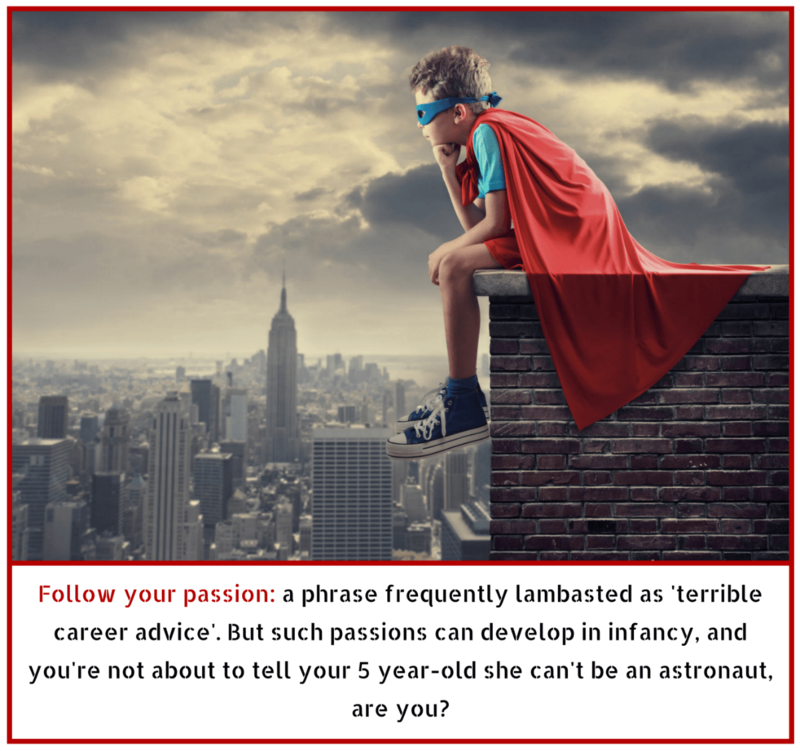 Passion starts at a young age for most people, so pursuing whatever that passion is becomes natural when we grow older and start looking for a career. Therefore, calling a job the 'best' or the 'worst' is quite frankly an impossible task, as it will be different for everyone. Now that disclaimer is out of the way, how exactly do we plan on ranking 'good' jobs and 'bad' jobs effectively? Well, from extensive research and multiple interviews, this article looks at the various aspects of jobs - taking into consideration salary, satisfaction, benefits, hours, progression and stress levels. Hopefully we'll then be able to put together a somewhat useful list of the best and worst jobs across the UK by industry and title. Job satisfaction can come in many forms and is dependent on your personality and interests. For example, a creative kind of person is obviously going to get more job satisfaction from creating and making things than, let's say, accounting or admin. Likewise, extroverted people will tend to get more job satisfaction from face-to-face sales rather than a 9-5 office kind of career. Making goals too easy to achieve can actually have a negative impact on job satisfaction. For the purpose of the article though, we need to think more universally than just on a specific career. I guess the question is then, what traits of a job transcend industries and generally lead to overall job satisfaction? According to a study by Abdul Raziq and Raheela Maulabahsh, good workplace environments show a positive correlation to increased overall job satisfaction. From over 210 respondents (spanning three different job sectors), they found that balanced working hours, job security and positive workplace relationships all contributed to employee loyalty and job satisfaction. Having a sense of purpose and importance in a job stems from employee motivation. Using goals and incentives to accentuate an individual's purpose is the most successful technique - as it shows that their hard work and efforts aren't going unnoticed. As John F. Kennedy said, "efforts and courage are not enough without purpose and direction". Although similar to the above, challenges do differ slightly from purpose and goals. Making goals too easy to achieve can actually have a negative impact on job satisfaction, as it promotes complacency and a lack of development as a person. Likewise, goals that are simply impossible to reach can cause stress and resignation - two elements detrimental to job satisfaction. Ensuring tasks are challenging enough but achievable is the key to creating happy employees. Rating jobs solely by their salary is like judging a Ferrari by its fuel consumption: you're kind of missing the point. Teaching, although renowned as a stressful vocation, ranks high on the job satisfaction survey. According to Karina Thompson, a reception teacher at Greenleaf School, what makes teaching so rewarding is seeing the "lightbulb moments and watching children make leaps in learning." Other teachers went on to say that making a difference to someone's life in such a way is very rewarding - along with the ability to watch them improve and find their passion. Having a good work / life balance has, for a number of years, ranked as the highest priority for many employees in the UK. What else is evident from the top 5 most satisfying roles is that the careers listed are either helping others or creating 'things'. A recent survey conducted by Stormline asked over 1,000 adults what filled them with 'professional pride'. The study found that the most common answers were 'producing something tangible and innovating' along with 'offering aid and help to others'. 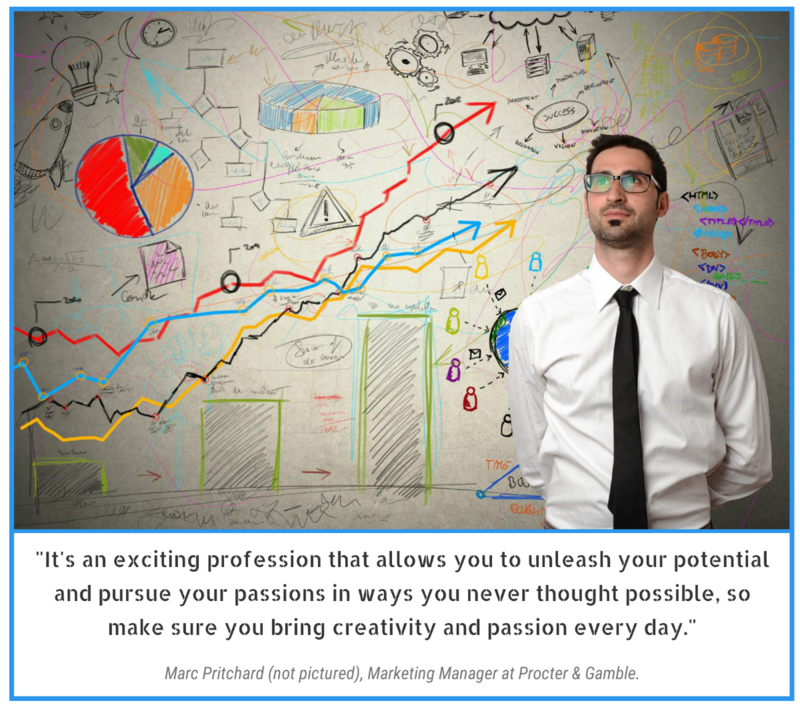 One such role that offers an abundance of creativity and innovation is that of a Marketing Manager - which ranked 5th on the list of the jobs offering the most satisfaction. I was lucky enough to get a few words from Laura Chetcuti, Content & Community Manager at Edge Global Media Group. "I love my job because it gives me creative freedom. It's impossible to get bored working in marketing, particularly on the creative side. Whether I'm working on an intense campaign for a client or blogging for the job boards, the autonomy I'm lucky enough to have gives me the freedom to work on things that genuinely do interest me." "When you find something you're truly passionate about, you don't work a day in your life and that phrase rings so true for me. People who say it isn't true clearly haven't quite found what they're looking for because I can vouch for the fact that it does exist!" Whilst some jobs may have lower salaries, this can be nullified by a wide range of benefits - such as company cars and health insurance. "The best part of my job is being the voice of customers in product development conversations. Being able to really influence what is brought to market so that it addresses real user needs and expectations. Focus on the insights and the rest is magic." "My role as Head of Marketing here at Digital Next is both challenging and rewarding. I have worked both client and agency and the resource you have within an agency is refreshing and educational. I have gained so much knowledge within the fast-paced marketing world and I thrive from the continuous digital changes we encounter, as we need to keep one step ahead in order to market our clients effectively." A noticeable trend in the least satisfying jobs across the UK is the fact that all roles are quite monotonous. Although every vocation has an element of this, the repetitive nature of consistent cold calling (Insurance Policy Clerks), or cleaning and maintaining 200 identical rooms in a hotel (Maids & Housekeeping), proved to be the most common reasons cited for such careers being the least rewarding. Rating jobs solely by their salary is like judging a Ferrari by its fuel consumption: you're kind of missing the point. With higher paid jobs often comes more responsibility, and with more responsibility comes increased stress levels. So although the hefty monthly wage slip might seem attractive, it isn't the definitive answer to what the best or worst jobs might be. But for the sake of the article at least, let's look at jobs entirely from a monetary perspective for a moment. The average salary in the UK is £27,600, with workers in London earning some 74% (yes, that's seventy four) more than this - which just about compensates for the increased house prices and living costs of the capital. The salary-by-region heat map above appears to contradict the salary average of £27,600 previously quoted. This is because the heat map is based on small sample of data collected by Agency Central, hence the figures are skewed slightly. However, the map is still useful as it gives a bigger picture of the country's fluctuating payscales. 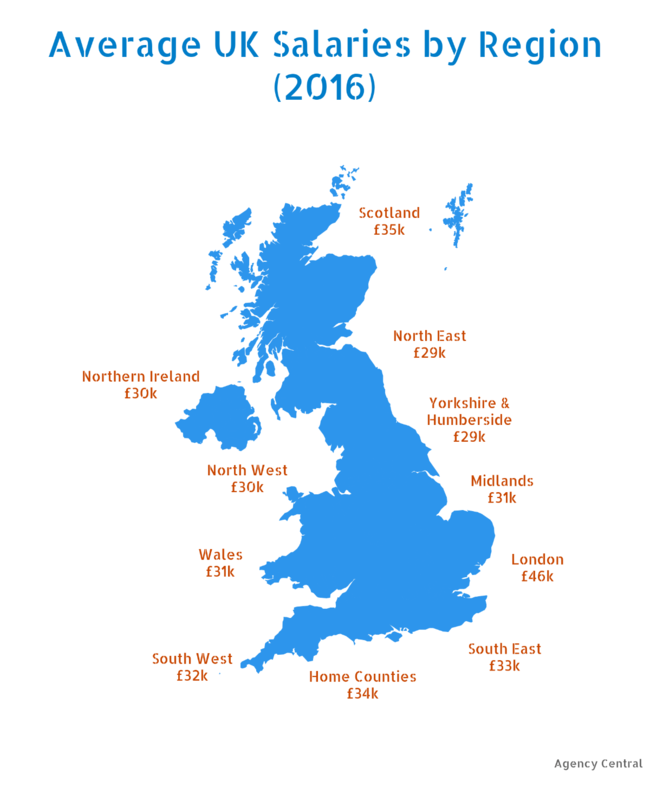 Such is the gulf in average salaries across the country, that if somebody on an annual salary of £29,000 up in the North East decided to up sticks for the capital, they would suddenly find themselves some £17,000 behind the average wage. Of course the wages down south for the same job would be respectively higher - but the inflation in living costs would soon consume any subsequent pay hike. It's worth touching upon something not considered under the salary segment, and that's benefits. Whilst some jobs may have lower salaries than others, this can be cancelled out by a wide range of additional benefits - from company cars, health insurance, gym memberships and mobile phones. With the advancement of technology over the past 20 years, came the ability to complete certain jobs remotely. 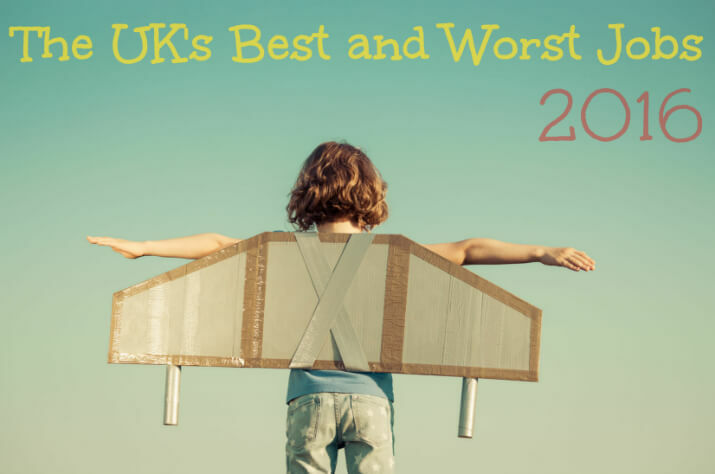 Although it is difficult to say exactly which companies offer what benefits, we discovered that Expedia, Virgin and Unilever all ranked highly as UK employers offering the best benefits in 2016. Arguably more important than salary AND satisfaction, having a good work / life balance has (for a number of years) been listed as the highest priority for many employees in the UK. With the increasing popularity of work from home schemes, more flexible working hours (and even shorter working hours), and incentivised paid holiday leave, UK workers are striving for more family time. Many top employers are recognising this, which is why more jobs than ever before are now offering an increased level of flexibility when it comes to work and play. However there are certain industries that simply can't afford the flexibility of others - sales, construction and medical to name but a few. With the knock-on effect of skill shortages, careers in construction can experience a severe lack of staff - leading to increased responsibilities and longer hours for anybody already in the profession. Likewise for the medical sector, a lack of qualified GPs is proving to be a growing concern as the NHS struggles to cope under the strain of an ever-increasing average lifespan and overall population. But some industries are quite the opposite of this and are able to offer such rewards as ways to attract the best talent in the business. With the advancement in technology over the past 20 years, came the ability to complete a range of jobs remotely. Internet-based innovations such as email, video calling and new methods of business networking means that there's no reason why some professionals can't take a conference call or send work emails from the comfort of their own home. In fact, technology has had such an impact on the way we work, entirely new job roles have developed in recent years - such as Virtual Assistants (VAs). Much like a Personal Assistant, a VA completes all of the usual, organisational day-to-day tasks of a business but without the lengthy commute to the office. As Alison Coleman puts it: "Even personal assistants (PAs), traditionally the heart-and-soul of an office, are working out of the office." Interestingly, 3 of the 5 jobs ranked as giving the best work / life balance didn't exist 30 years ago, at least not in their current capacity. The invention of computers and the internet has not only created a multitude of entirely new careers, but it has also provided the world with a far better work / life balance. It is also worth noting that, although teachers appear high on this list, it is partially based on their 'standard' working hours and holiday time. So, on-paper, they seem to have a better work / life balance than most. However, this isn't always the case. Many teachers work long after the bell rings and throughout school holidays - marking exams, coursework and preparing lessons. I know this first hand as my mum is a teacher and always brings a bunch of work home with her. Predictably, jobs that require long and unsociable hours fared the worst, with pilots, nurses and journalists all making the top 5. 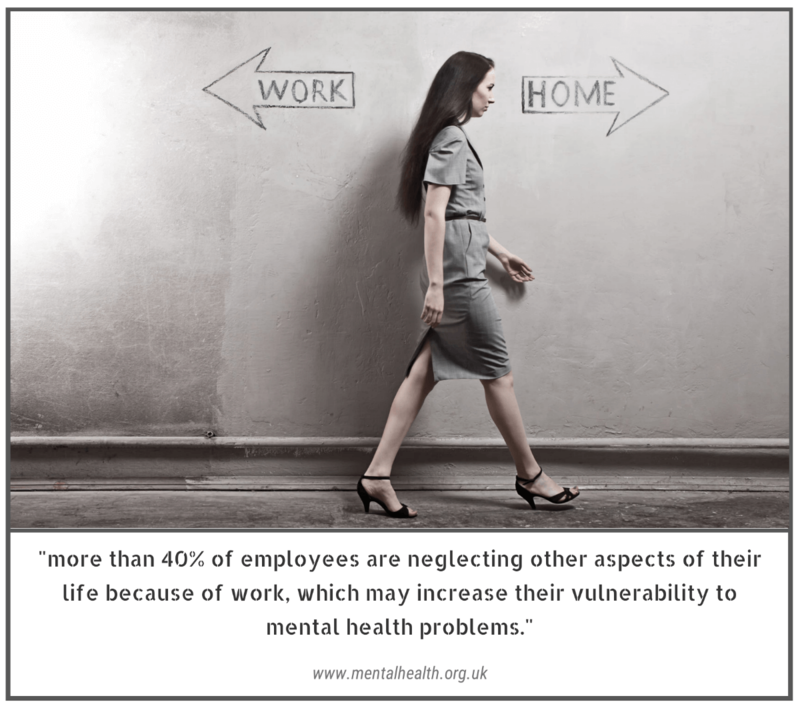 Such roles require high levels of responsibility (people's lives in your hands) and stress, which makes it more difficult to 'switch off' when a working day is finally over. Interestingly, 3 of the 5 jobs ranked as giving the best work / life balance didn't exist 30 years ago. Other notable careers suffering similar setbacks include oil rig workers and people serving in the military. Both of these careers carry high mortal risks and mean extended stints (often months at a time) away from family and friends. So what is definitively the best and worst job in the UK? well that depends on who you ask. And yes I'm very comfortable sat on this fence of mine. At the end of the day, certain careers will appeal to certain people (something I summarised perfectly a couple of thousand words ago, thanks for staying with me) - so nailing down the 'best' job is simply impossible. I know I know, an unsatisfying conclusion to an article promising so much controversy and debate, but I simply refuse to put one career on a pedestal and another in the gutter. So there you have it. You're probably still none the wiser on which jobs are best to pursue and best to avoid - so if you're looking for some further advice on what career is right for you, go and check out 'what career is right for me?'. There's advice, information and even assessments on there that can determine which vocations suit your personality and interests. If you should need any help in finding that perfect career, you don't have to search alone. With hundreds of specialist recruitment agencies on our directory, you can put the task into the hands of the professionals - who are sure to find you your perfect role. Remember: passion is the difference between having a job or having a vocation.